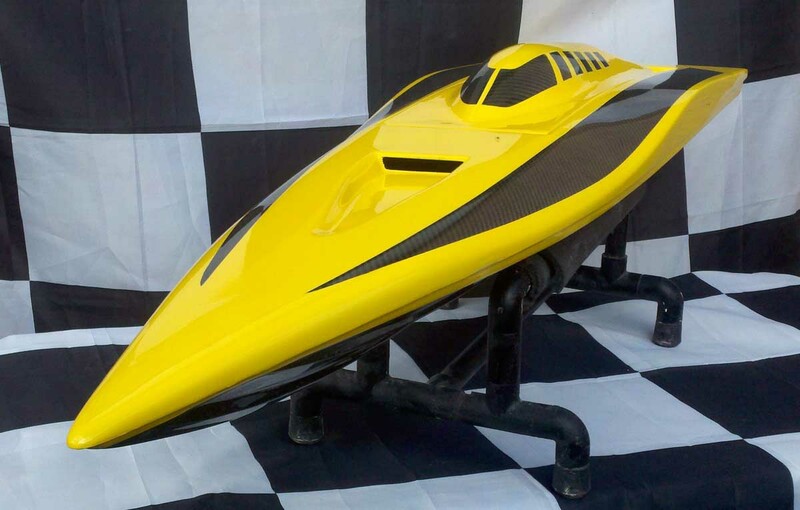 This hull has a slim line euro look that is very aerodynamic and this unique design of hull enables faster top speeds on calm or rough water using a MODIFIED ZENOAH or QD ENGINE with better handling characteristics than any other hulls of this size, which enables you to be out front in control and win!. 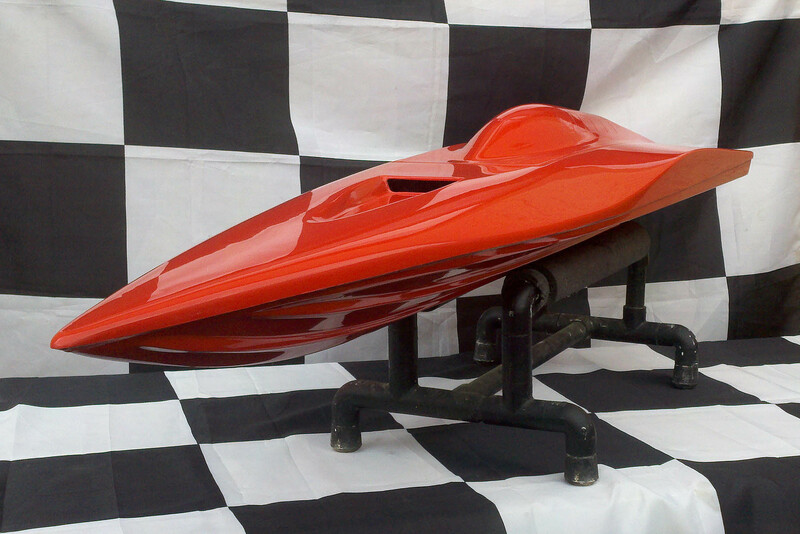 Fastest 56" Mono in the World! We use a Certified Aerospace Grade AS4 644ksi Carbon Fiber. 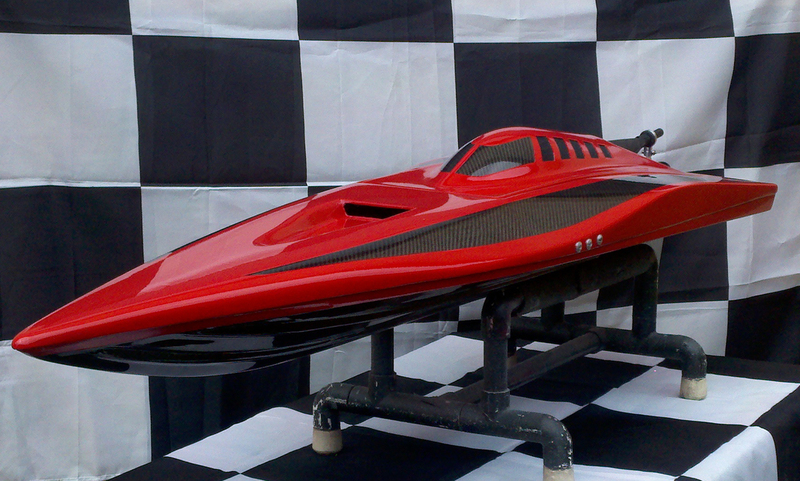 Our Fiberglass and Carbon Fiber Hulls are manufactured by a Vacuum Infusion Process (VIP) Not a vacuum bag or Hand Lay-up like others do..
Due to the nature of VIP the resin usage becomes very predictable, while other hull builders or manufactures use the standard by hand lay-up; which makes their hulls vary in resin content due to the human variable and they have to hide the air bubbles with gel coat and that is why some hulls have different weights & stiffness. 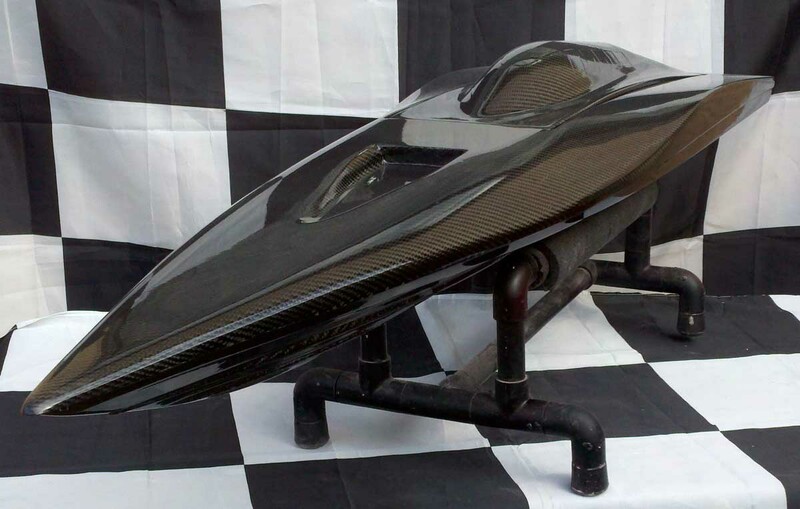 The Carbon Fiber Raptor Mono Hulls have a written Limited Lifetime Warranty against separation and / or splitting damage while racing at sanctioned events or sport boating. Cosmetic damage is excluded. All Sales are final and there are no refunds or exchanges on any of our boat hulls and the only exception is with the written Limited Warranty on the Carbon Fiber Mono Hull that is shipped with each hull.. For us be able to keep cost of inventory to it's minimum and pass the savings to the consumer all of our hulls are manufactured individually by the order of the completed purchase from customers and there is an approximate 2-6 weeks lead time before shipping your order and additionally your hull can be ready to ship sooner or even later than the mentioned lead time and in that case we will notify you and keep in contact with you on the progress of your order.